Smallest and lighest Industrial and Pharmaceutical Grade Particle Counter with stainless steel enclosure, and 6-channels with a built-in printer, pdf reports, and the most advanced technology ensuring the highest level of accuracy and repeatability of measurement. Drop and vibration tested for industrial use. In business for over 55 years, Climet has dozens of multi-jurisdictional patents in field of particle counting. Climet is a pioneer and innovator having been the first to introduce the battery powered portable particle counter (CI-500) in 1993. Since then, Climet has developed virtually every meaningful feature for portable particle counters, many of which today are considered industry standard. This includes but is not limited to high flow rates of 50 LPM, 75 LPM, and 100 LPM. The CI-x70 Series is fully compliant with ISO 21501-4; PIC/S; FDA CGMP; EU GMP, Annex 1; ISO 14644-1/2:2015; 21 CFR Part 11, and others. • Industrial Use: 1m drop tested (14x up to 94 g's) and vibration tested (1 hour), then powered-up and passed calibration. • Battery: Single lithium-ion for up to 6 hours of continuous operation (depending on model) - That's a 100% duty cycle with a zero count filter installed. • Network time server synchronization - First on the market! • Sample Data Storage - Up to a million samples or more! • User IDs: 100, and factory expandable! • Location IDs: 100, and factory expandable! • Programs: 100, and factory expandable! • Weight: Stainless Steel enclosure at only 9.4 lbs. with battery installed! An energy efficient design, the CI-x70 will run longer on a single battery than the competition using a dual-battery configuration. When comparing battery efficiencies, don't be fooled by comparisons of "nominal" or "typical" use. 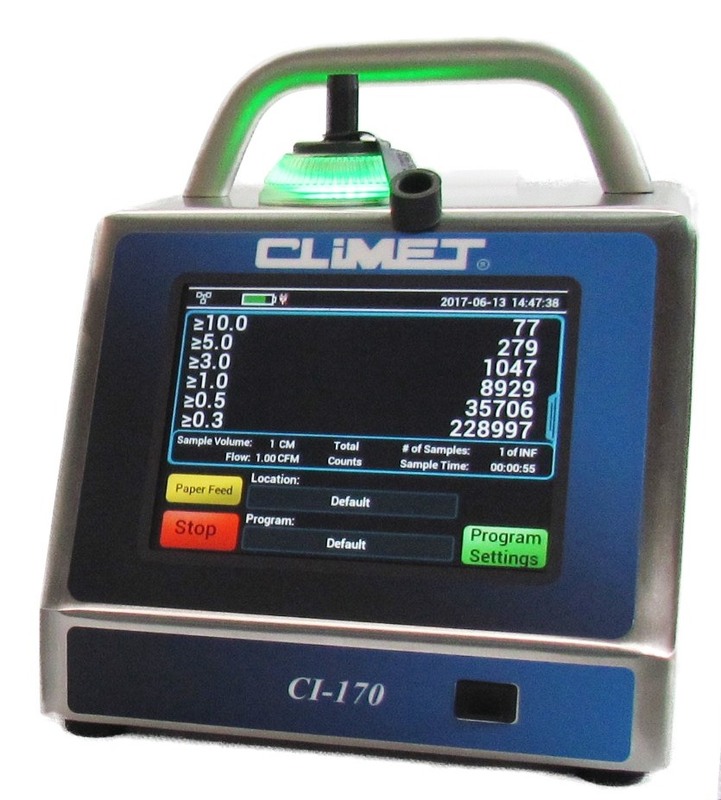 Climet conducts battery testing with "continuous" use (laser and blower engaged with 100% duty cycle, and with a zero count filter installed). The single battery configuration means Climet customers will spend substantially less money over the life of the instrument on consumables, including batteries. The CI-x70 Series is truly the next generation of particle counter, with onboard intelligence unsurpassed on the market today, it provides Climet a platform for future enhancements, and scalability to satisfy custom technical requirements. The CI-x70 Series are pharmaceutical industrial grade 6-channel portable particle counters that come in your choice of 1 CFM, 50 LPM, 75 LPM or 100 LPM flow rates. Each model comes standard with an RS-232 serial interface, Ethernet TCP/IP, and USB. Seamless stainless steel enclosure simplifies cleaning and sanitation. A completely sealed front panel display prevents biocides, IPA, and other cleaning fluids from accidently leaking into the interior of the particle counter, thus eliminating the risk of short circuit or premature catastrophic damage to the sensor. An expert in manufacturing industrial instrumentation, every new Climet instrument design is drop and vibration tested ensuring end-users can expect up to a decade (and beyond) of reliable operation. This level of ruggedized testing is unique in the industry, and ensures accidents don't turn into capital appropriation requests or expensive repair bills. Each particle counter deployed in the Life Science industry must have a HEPA Filtered Exhaust, or otherwise risk regulatory action (i.e., an observation, finding, etc.) due to rouge particle emissions. Over the past 50 years our own experience confirms that not all HEPA filters are created equal, and that among the more expensive and higher quality filters an average of 10% still fail a leak integrity test. For this reason, Climet is the only manufacture of particle counters that conducts emissions tests on every new factory model, and certifies emissions to ISO Class 3. This provides an added level of assurance to end-users that their particle counters are not adding to the particle burden of their cleanroom. A long-earned reputation in the industry for manufacturing the most accurate particle counters, Climet particle counters have unparalleled repeatability (in metrological terms: stability or precision) of measurement. Over 50 years of manufacturing experience and use of the highest quality materials provides users unparalleled performance. High quality materials, an expert level of engineering acumen, and a mature DFM (Design For Manufacturability) virtually eliminate short-term and long-term calibration drift. This also enhances product life cycle, offering users a decade or more of reliable use. This is but one factor that greatly enhances Climet's reputation for providing the lowest TCO (Total Cost of Ownership). End users in regulated industries, and others of discerning taste for high precision instrumentation, exclusively sole source Climet as their preferred solution provider. Customers in regulated industries are generally required to re-calibrate their particle counters at least annually. Depending on the process or risk assessment, more frequent interval calibration may be required. When a particle counter is out-of-tolerance (OOT) during the interval calibration, a deviation report and investigation is required in regulated industries. Among pharmaceutical and biotechnology producers a simple failure investigation costs between $8,000 to $12,000 on average assuming no scrap or batch rejection. This cost is difficult to calculate as it's almost all labor and usually involves multiple departments. It is a hidden Cost of Poor Quality (CoPQ) associated with the instrument, which few end users track. As the cost of one simple failure investigation well exceeds the initial purchase price of a particle counter, we can conclude that CoPQ is frequently the #1 cost driver. The CI-x70 Series is compliant with 21 CFR Part 11, ISO 14644-1/2, and ISO 21501-4. Need something not shown below, please contact us! Exceeding standards and expectations. Climet uniquely manufactures our instrumentation, not to simply meet ISO 21501-4 standards, but to exceed the standard in order to meet user expectations for: (1) accuracy and stability of measurement; (2) mitigation of deviation reports and investigations; (3) ease of use; and (4) overall product quality. These factors uniquely provide our loyal customers the lowest TCO (Total Cost of Ownership). Buy From An Innovator, Not An Imitator: Climet, literally, invented the portable particle counter (1993), as well as higher flow rates of 50 LPM, 75 LPM, and 100 LPM (2005-2008). With a long history of successfully implementing disruptive technologies, our customers can rest assured they own the highest quality instrumentation available on the market. Every Climet particle counter is manufactured with the highest degree of engineering acumen, and incorporates one or more patented or patent pending technologies. Uncompromising Quality is in our Corporate DNA. Our success is not based on quirky marketing gimmicks, but rather rock-solid instrumentation that adds personal value, and that's time-proven and built to last a decade or more.